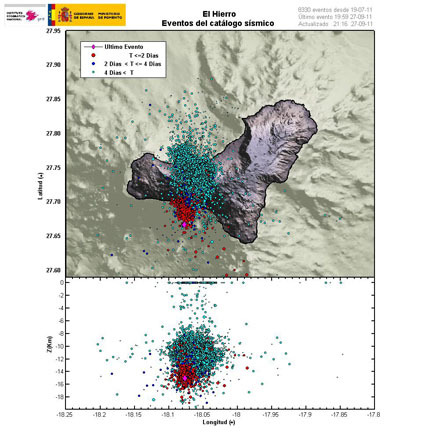 Seismicity at El Hierro over the past few weeks, with most recent in red. Image courtesy of IGN. Mike, you say, why should I care about earthquakes or the volcano in the Canaries?Â Where are the Canaries, anyway? Some 50,000 to 130,000 years ago a volcano in the Canaries collapsed into the Atlantic ocean and created a tsunami 300 feet high that raced across the sea in all directions including the east coast of North America.Â Can you imagine a wall of water 30 stories high slamming into New York, or Washington D.C. or Florida.Â The loss of life would be monumental.